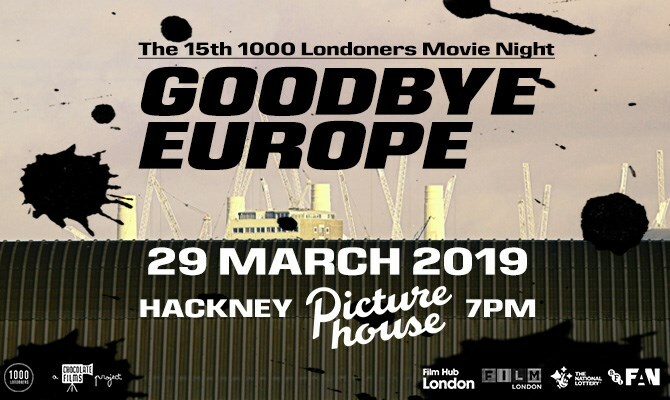 In the days that the UK leaves the EU, 1000 Londoners (a Chocolate Films project) invites the people of London to join ‘Goodbye Europe’ – a unique film screening created specifically for this historic moment in the capital. A German man and woman who came to the UK on the Kindertransport in the World War II era and met and married in later life. A Dutch stay-at-home Dad who offered his spare room to a Syrian refugee. The films will take you inside a cage fight, an evangelical church and a rehearsal room at the Royal Ballet. They will show you the perspectives of a Bulgarian abseiler, a Swedish economist, a Spanish Big Issue vendor, a Finnish hairdresser and many many more. The films will be edited along BFI footage from the 50s to today, curated by the archivists from London’s Screen Archives. Following each screening, we offer a panel discussion with filmmakers and contributors. 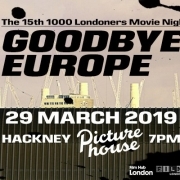 ‘Goodbye Europe’ is the 15th and most ambitious 1000 Londoners Movie Night to date. 1000 Londoners was launched in 2014 to tell the epic social story of our city today through 1000 documentary portraits of Londoners. See ‘Goodbye Europe’ at the National Portrait Gallery on 15th March, the Museum of London on 18th March, Ritzy Cinema on 27th March, Curzon Soho on 28 March and Hackney Picturehouse on 29th March.